We love the Crystal Palace! Even though it’s a buffet, the Chef always brings us freshly prepared items from the kitchen. We were sad to find out that Chef Paul had moved on to Universal. However, all Disney Chefs are fully trained to accommodate food allergies and, this time, we met Chef Ron. He was fantastic! He prepared eggs, bacon, waffles, muffins and doughnuts, with maple syrup. It was much more than Charlotte could eat, but she had plenty of choices. We took the leftover doughnuts for a snack later. We love breakfast at Crystal Palace. We typically make a reservation early, so that we can enter the Magic Kingdom before opening, which allows us to get some fantastic photos in front of Cinderella’s Castle without any large crowds in front. 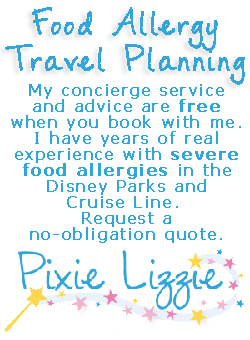 Want to know a great Disney World secret? 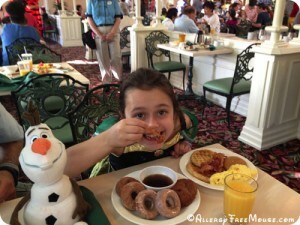 Make breakfast reservations at a time before the park opens. You’re allowed into the park and, on the way to your reservation, you can get great photos without all the crowds. Plus, the PhotoPass photographers are there, ready to snap some great group photos, even with your camera. This is the best way to get a Castle shot without crowds or unintentional photo bombs. Ok, better than that, if you can believe that, is Chef Paul at the Crystal Palace. He was so accommodating and brought my daughter allergy free Mickey waffles, bacon, scrambled eggs, grits (we’re Southerners), OJ, chocolate cake, a donut, garnished with strawberries cut into roses. The cake and donut are made with Bob’s Red Mill mix. 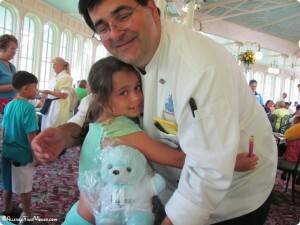 Our daughter was so blown away that she gave Chef Paul a blue AllergyFreeMouse.com teddy bear. Chef Paul — we love you! He was super-informed and presented so many options for our daughter, and then delivered more. 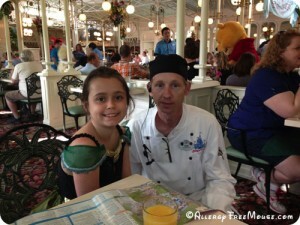 Chef Paul is what Disney is all about — pure magic in the eyes of a child. Plus, he earned lots of respect from two parents who felt everything was truly safe. 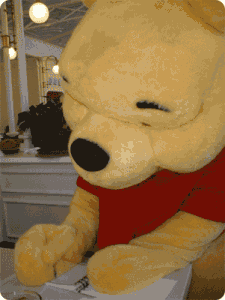 Winnie the Pooh, and a buffet, too. This is a great Character Dining experience. However, the buffet is a real opportunity for food allergy cross-contamination. We visited the Crystal Palace for lunch. We arrived a bit earlier than our reservation but, after a little wait, they were able to accommodate our little party of three. 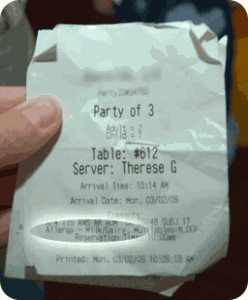 The hostess had our dairy allergy noted on the reservation receipt that she supplied to our waitress. We also discussed the allergy with the waitress and asked to see the chef. The Crystal Palace was packed at lunchtime, so it took a little while for the chef to visit. However, once he came by, he listened carefully and offered a tour of the buffet to discuss options. It’s huge buffet, with a lot of variety, but very little to offer that was completely dairy-free. We opted for a freshly prepared meal of allergy-free chicken fingers, french fries and apple slices. Even if we had found dairy-free items on the buffet, we would have requested a fresh version, since the buffet is frequented by kids and other adults who have very little understanding of cross-contamination and the impact to those with food allergies. 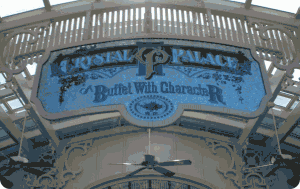 For those without food allergies, The Crystal Palace buffet is excellent, if you like big buffets. It full of American style food, with a lot of variety for breakfast, lunch and dinner. And it, of course, includes a dessert buffet. Again, there was nothing dairy free or clear of cross-contamination issues, so we skipped it. The Winnie the Pooh gang was really exiting for our daughter. She met them all, and there was plenty of time for photos, autographs and hugs. Unfortunately, they also hug every other kid in the place. And the other kids were most likely in the middle of eating something just before the hug. This is how we learned about food allergen exposure via fur. As we were getting ready to leave, we noticed hives on my daughter’s face. She wasn’t having any difficulty breathing or sneezing, but we gave her the doctor recommended dose of Benadryl. We believe, based on the location of the hives and the fact that she didn’t exhibit any other symptoms of exposure, the contact must have from one of the Disney characters when she was hugging them. 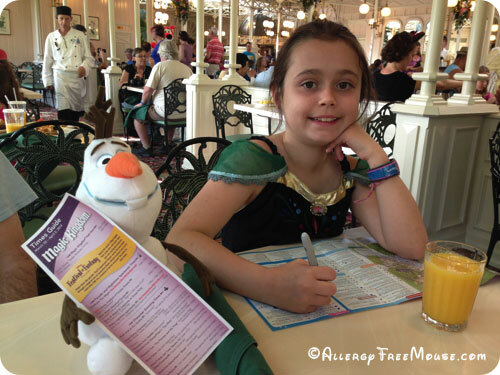 Other than the food allergen contact from the characters, the dining experience was nearly perfect. Overall, The Crystal Palace was a bit hectic, and the food was good, but meeting the Disney Characters is the best part. 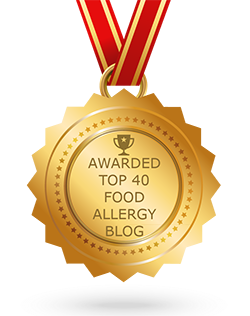 Just be careful if food allergen contact with skin is an issue. 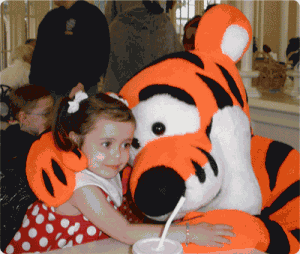 Be sure to wipe down the chairs and table, and your child after they meet the characters.